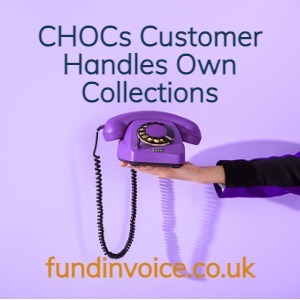 It may sound like a type of confectionary but the acronym "CHOCs" is widely used around the invoice finance sector, and it has nothing to do with chocolate. It means Customer Handles Own Collections and may sometimes be called CHOCCs (Customer Handles Own Credit Control) which is used to describe the same type of facility. It is a less common form of receivables finance where the finance company maintains a full open item shadow sales ledger (usually) but the customer undertakes the credit control activity i.e. chases customers for payment. As a product, it sits somewhere between invoice discounting and factoring. The facility is disclosed, such that invoices bear an assignment clause and debtors may be given a notice of assignment. This gives the funder a more secure position, as their ownership of the debts has been disclosed to the end customers. In view of this, CHOCs may be suitable for customers that might not qualify for a confidential facility, but that want to be able to control the contact with their customers, rather than opting for factoring where the funders undertakes the credit control activity on their behalf. CHOCs can be cheaper than factoring because of this difference. Users will need to have adequate credit control procedures in place, in order to be eligible. Shadow ledger explained - a "shadow ledger" is when the funder maintains a copy sales ledger for their use. It is composed of a snapshot of all the invoices outstanding at the time of "take-on" (when the facility starts), and new invoices, credit notes and payments are applied to the ledger as they are raised or received. It means that should anything happen that causes the funder to need to collect in the invoices e.g. failure of the client business, they have the sales ledger already set up and ready to go - this gives them a slightly greater level of security, which can be helpful in offering funding to some businesses. The alternative is what is referred to as a "bulk" facility. In these cases, the funder only maintains control balances to track movements in the overall value of the sales ledger i.e. without the open item granularity.